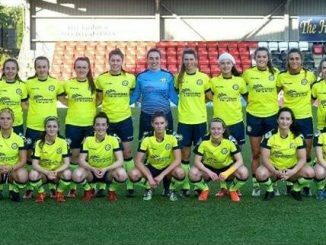 Sion Swifts will meet Newry City in the Electric Ireland Irish FA Women’s Cup Final at Windsor Park, winning on sudden-death penalties after a 1-1 tie with Crusaders Strikers. 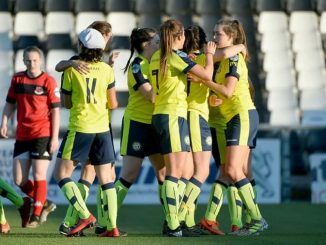 In an end-to-end encounter, Sion began to edge possession as the first half progressed and seized the advantage on 26 minutes, as Kendra McMullan connected with a corner to send a looping shot into the net, despite the best efforts of Crues ‘keeper Leigh Skelton, reports irishfa.com. Crusaders attempted to get back on level terms almost immediately but found Swifts more than capable of soaking up the pressure. After the break Sion ‘keeper Niamh Mailey was called into action early on to make a fingertip save. As conditions worsened, credit must be given to both teams for producing an entertaining game in a full scale downpour. Then, as the rain eased, Crusaders levelled through Julie Nelson, who unleashed a blistering free-kick which gave the despairing Mailey no chance. Sensing victory, Crusaders continued to press but found the Swifts ‘keeper on top of her game and equal to anything they could throw at her. At the other end McMullan almost snatched victory for Sion only to be denied by a wonder save from Skelton. Extra-time came and went with neither side able to gain an advantage. That meant the dreaded penalty shoot-out, and even then there was nothing between the sides with the scores tied at 4-4 after the initial series of spot-kicks. And so onto sudden death … and another three rounds of successfully dispatched penalties. 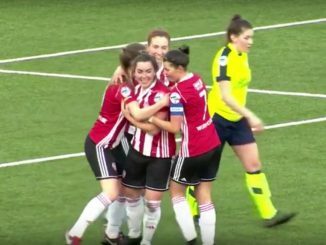 That was until Heather Means failed to convert for the Crues meaning that Catherine Hyndman had the chance to win the tie for the Swifts, which she duly did after calming stepping up to send the ball past Skelton. Newry City had a walkover in the other half of the draw, with lower league Carnmoney having withdrawn.